WTI prices corrected from a 3-months highs of 57.83 per barrel on the back of a stronger US Dollar. A broad-based US dollar strength combined with ongoing global economic slowdown fears, dampened investors sentiment. 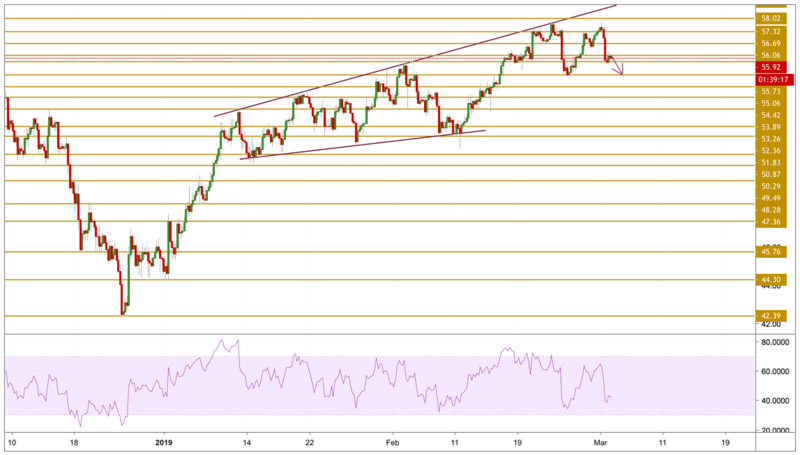 However, with reports stating that a trade deal could be imminent between the US and China, the global economy would likely recover causing that could further strengthen the demand for oil and extend the uptrend with prices already supported by OPEC cuts. Furthermore, Baker Hughes reported Friday that the oil and natural gas rigs active in the United States fell to 843 in the week ended March 1, the lowest level since May 2018. After surging towards fresh highs of $57.83 per barrel, Crude prices failed to hold above it and retreated sharply towards $55.7 territory. The price is currently hovering just below the $56 level with a bearish momentum. if the price fails to gain strength from here, the a deeper correction is most likely to occur and the pressure will be on the critical $55 level.